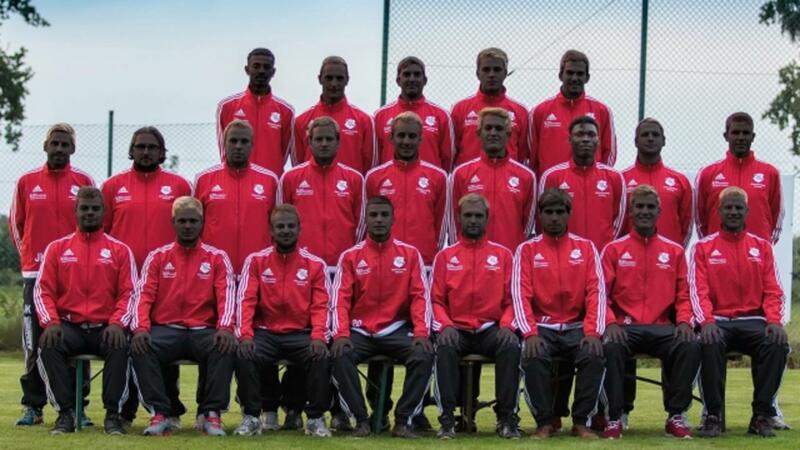 On Wednesday, the German soccer club Deinster SV uploaded a blackface photo to their Facebook page that has garnered over 15,000 likes as of noon Eastern Thursday. Accompanied by the hashtag #UnitedWeStand, the photo is of the team with digitally darkened faces. The photo is a reaction to racism that one of its two black players recently experienced, according to NBC News. "This has nothing to do with racism, we just wanted to show solidarity," team spokesman Frank Sandmann told NBC News. Emad Babiker is a Sudanese refugee who has played two seasons on the team. On Saturday, he was physically and verbally attacked, and the investigation is still underway, according to NBC News. The translated caption called the attack "just sad!" It continued, "Violence against refugees is pathetic!! Emad and Amar — You belong to us just like anyone else from the Deinster sports club and we are happy that you are with us!!!" Some reactions to the photo are positive, with people around the world calling themselves fans of the team. A commenter called the statement "absolutely brilliant," and another said it showed "moral courage." But not everyone finds the action as progressive as Deinster SV intended it to be. "The attitude and the concerns I find strong, the method of the black facings rather sad," one commenter said.